The New York Green Advocate: Do You Use Facial Scrub? If So, Read This! Do You Use Facial Scrub? If So, Read This! Read the Post by Marcus Eriksen of 5 Gyres On EcoWatch About Plastic In Facial Scrub And How It Is Ending Up In Our Waterways! 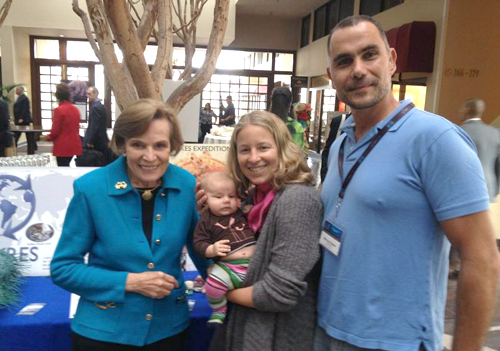 Dr Sylvya Earle with Anna Cummins, Marcus Eriksen and their baby Avani at Blue Ocean Film Festival. "We’ve got some important news to share about plastic pollution upstream in the Great Lakes, the first expedition to study plastics in inland U.S. waters. We’ve analyzed our data from samples taken in the Great Lakes and what we found is shocking. Microplastic particles, no larger than grains of sand, peppering the lake surface. One sample had more than 600 of them. Yikes! What could they be? After some investigation, we’ve figured it out. The culprit? Non-natural facial scrub products that employ micro-particle polyethylene beads as an exfoliant. The beads are designed to go from your face down the drain and then to the ocean. We’ll be launching a campaign to address this problem in the coming months and we’ll need your help to claim another victory for the ocean." I am a huge fan of 5 Gyres since I met the co-founders Marcus Eriksen and his wife Anna Cummins at a SPARK in NYC.